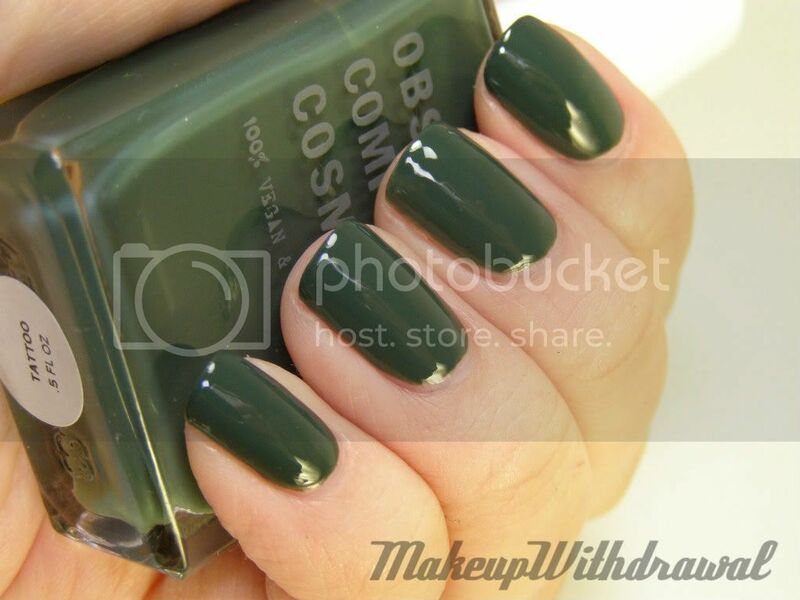 Recently, OCC had a few of their nail polishes on sale, because they're redesigning their bottles. I ordered a few and low and behold- I received two of my polishes in the new bottles. I was quite thrilled, because I really like the flat rectangular shape with the long handles. It makes applying polishes quite easy. Tattoo is my first polish from OCC and I am mighty impressed. 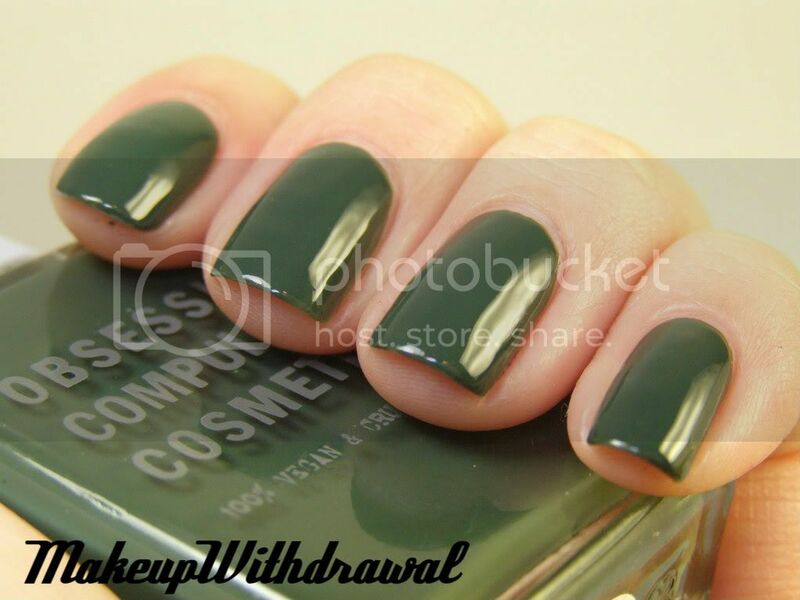 The formula was very creamy, leveled well and opaque in just one coat. I did two because my camera loves to find flaws and out of habit (I started on my second coat before I realized I didn't need one). I see why this color would be called Tattoo- a dusty, dingy, murky sort of green that you might seen black ink fade into on an old tattoo. I don't think I've ever really seen this color in a faded tattoo. I have however, seen a few ladies with old cosmetic tattoos that have faded into an interesting shade of blue. Blue eyebrows. Not exactly the natural look! OCC is also vegan, and cruelty free. An admirable company, if I do say so myself. 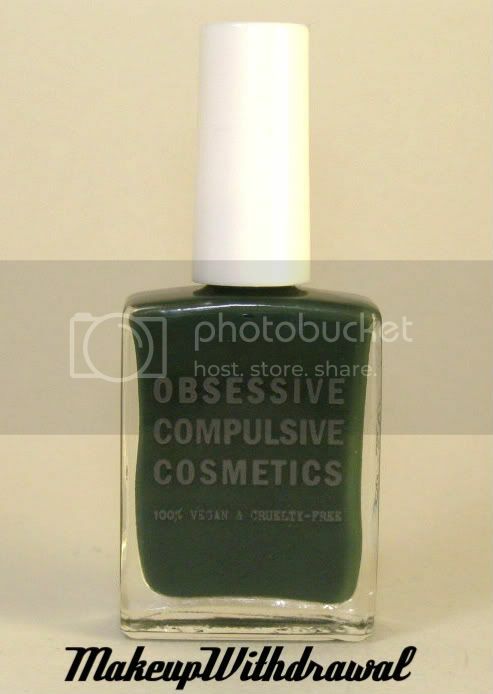 Obsessive Compulsive Cosmetics can be purchased online at their website (here). Their polishes are $8 each for .5oz bottles. What do you think of this color and the new OCC bottle shape? Have you ever seen a tattoo fade into this color? I sure hope mine never does!